I have one more app to share today. 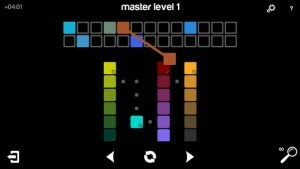 It’s called “Blendoku.” It’s a color game where you arrange swatches of colors in the right blending order. The game play is super simple, but I think it’s one of those successful puzzle games that you can play for a long time without getting bored. 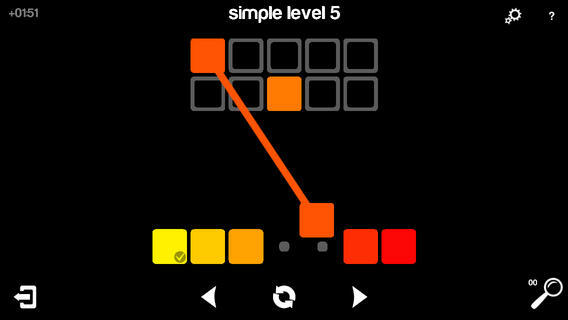 The levels are easy at first, but it gets pretty difficult as your level goes up. The visuals and interactions are very simple too (you either tap or drag the swatches to place them in order). Everything in this app works coherently and smoothly. I’d like to introduce this game called “Tengami” today. It is an incredibly beautiful platforming game where everything looks like fine paper craft. 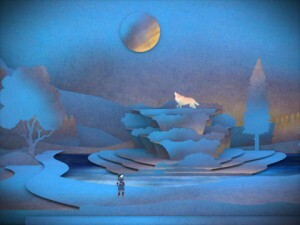 The world and the music have a Japanese folktale-like feel, and works very well with the paper craft aesthetic. The entire world is built in the aesthetic of pop-up paper art, and the player character looks like a piece of paper too. There is only one character in the game, and you control him to solve puzzles and revive a withered cherry blossom tree. In the game, you literally “unfold” new stages and hidden stairs by touching the screen. It’s a simple interaction, but it was exciting for me because it felt as if I were flipping through a real pop-up book. There actually isn’t much narrative or explanation, so you never find out why your character is trying to revive the tree in the first place. As a game, it also gets a bit frustrating because the character moves so slowly. You need to move back and forth a lot to solve puzzles, but because your character moves super slow, you end up spending most of the time just watching him walk. Also, you double tap to move your character, but I think there needs to be better controls for the character. The “unfolding” interaction I mentioned above feels good, but the double tap feels rather incoherent with the visual and musical themes. 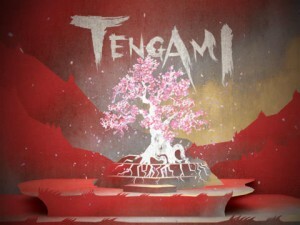 The gameplay is not the best, but overall, Tengami is an extremely pretty and delightful app. I really enjoyed the visual experience. I would recommend it! Our first prototype is HERE. – The most important learning was that there needs to be a clearer indication that this app is a guessing game. The home screen didn’t contain any hints as to what the users should expect from the app. Users seemed just as lost even when a snap loaded, and didn’t know what to do. Even when we walked the users through the steps, they seemed confused, so it is important that we embed better cues. In terms of prototyping technique, we learned that having a placeholder photo would have helped the users understand what was going on in each view. – Another reaction we got from all the users was regarding the score display. We decided to show the user’s score after the rating has taken place, but users were confused that they didn’t get to see their scores right away. The sequence of “rate –> score” was different from the general expectation. We were suggested that we combine the score and rating views. – When viewing a snap before making a guess, users said they wanted to skip and make a guess instead of waiting until the time was up. We figured there needs to be a button that lets users jump to the screen to make his/her guess. 1. An app for controlling and interacting with a smart home environment. Here, a smart home environment could include, for example, refrigerators, air conditioners, heaters, lights, plant-watering devices, etc. The target users in this case would be whoever lives or wants to live in a smart home environment. 2. A mobile game where users guess each others’ locations based on photos. In a nutshell, this is Snapchat + GeoGuessr + Quizup. Using this app, a user will snap a photo of a landscape/landmark/object/etc in his/her current location, send the photo to other users, and those who received the photo will guess where that photo was taken. The photos will disappear once the receiver opens it, so that’s the Snapchat element. This could be a fun activity whenever and wherever you are, but we’re also thinking this could be fun while traveling as well. The app I want to introduce today is called “Covet Fashion.” It is a dress-up game, and what’s unique about this game is that you dress up your model with clothes and accessories from real designer brands. I’ve tried out quite a few dress-up games on my phone/iPad, and this one is my favorite, because it actually feels like shopping. 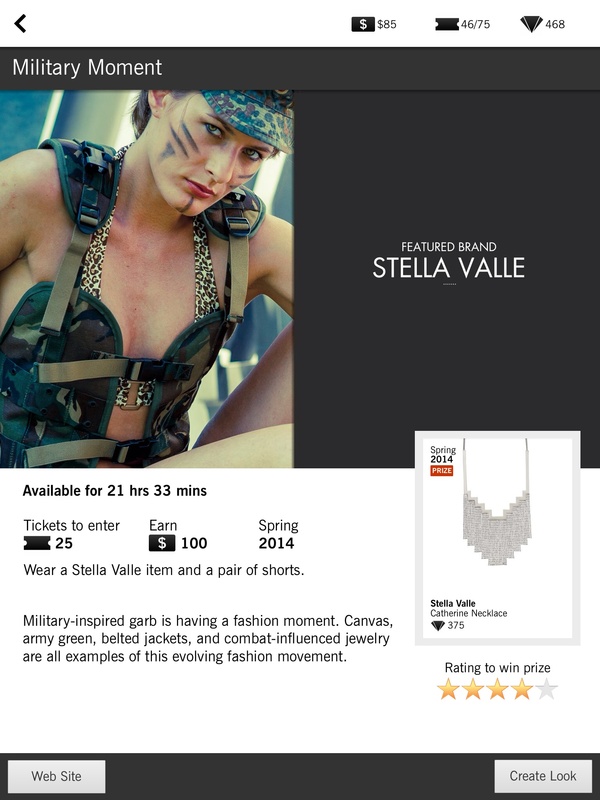 Aside from the shopping element, the main game element of this app is the fashion contest. There are a variety of contests with different themes and item requirements in the game. All the players style their models accordingly to the themes and enter the contests. Then, everyone anonymously votes for their favorite styles in each contest. The voting results can be strange at times and a lot of people complain that it’s rigged in the app store review section. But I think it’s still fun to vote because you get to see some really creative styles. 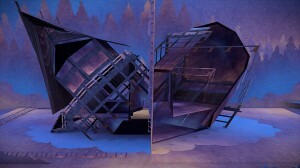 The screenshot on the left below is an example of a contest theme, and the one on the right is an example of the voting screen. 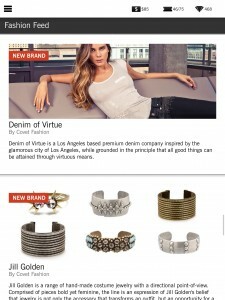 The app also has a little newsletter kind of section, where it introduces new fashion brands or updates for upcoming trends. You can also jump to the actual websites of those fashion brands from the game. I never pay attention to the newsletter or the real brands’ websites, because I just want to play the dress-up game. But I guess for players who are really into designer fashion trends, these options could be fun to look at. The app’s design is pretty sleek and I think it goes well with the trendy/fashionable content. Again, the voting system can ruin the fun of the game at times, but since I’m mainly excited about the dress-up activity, and also the fact that it feels like shopping, I don’t really mind the voting problem. In terms of UI, it’s easy to follow, and although the game is a bit laggy sometimes, it is pretty efficient. The in-game shopping really feels like online shopping, so that part was well designed as well. 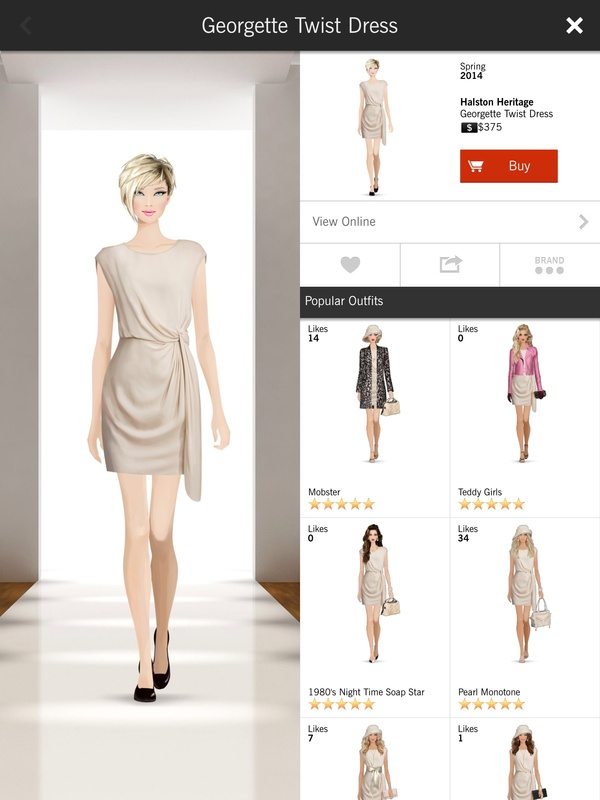 Covet Fashion is available for both iOS and Android. (But it seems like the updates for Android come a lot slower compared to iOS.) I’ve tried it out on both my phone and iPad, and I must say, it’s so much nicer to play it on the iPad, because I get to see all the details of each items a lot clearer. The main feedback I got from testing the prototype with Decho last week was about the color picker option in the note-taking mode. I had initially included four tools for the user to use in the note-taking mode: keyboard input, free-hand input, color picker, and photo attachment. Each of these tools was a tab, lined up on the upper part of the view. Decho pointed out that it felt strange that the color picker had its own tab, instead of being incorporated into the input tabs. So for this week’s iteration, I focused on packaging the input methods and color picker together. Snapchat was my precedent for this. Aside from changing the color picker, I got rid of the “download other dictionary” option and replaced it with the “about” information. I changed my idea from making a food encyclopedia that included all sorts of cuisines from around the world, to a food dictionary that would be specifically used in New York City. Since NYC is so culturally diverse, there are a lot of different cuisines available, but the names of all the menus and ingredients are written in English. (For example, even if you go to a Chinese restaurant in Chinatown, the menu is still in English.) So my app will be in English, and the contents will be searchable in English only. This way, I thought I would be able to avoid some confusion around the language issues, and also make it more practical. The reason I decided to include the “about” information was because I realized most apps had information about the creators and their contacts.